I blogged about how you can wrangle GNU assembler to understand NASM-type syntax on x86. If anybody has any luck doing the same on ARM, let me know! So I was actually thinking of using the PRU to sample a VGA signal, effectively making a video grabber. Can anyone suggest the best way of digitising the analog VGA signal at the appropriate rate? As a cheapo first draft, a biased BJT or 7404 as a 1-bit ADC. Right, I was thinking that single-bit resolution would be fine initially, I guess the bias would be to set the level at which the bit flips? Something like a potentiometer would probably help to figure out what makes sense. Not too sure how to get the voltage from VGA spec 0-0.8V up to 4-5V, though, which seems to be required by the 7404? You don’t have to think of the 7404 as a digital device. It’s just a pair of MOSFETs, so it’s basically a really high-gain amplifier with an arbitrary transition voltage. The potentiometer to bias things up really just moves the voltage range from 0-0.7V so that it straddles the high-gain region of the 7404. Looks like the “correct” approach is to use something like the TVP7002, which will do all the signal processing for me. Thanks again for the suggestions. You can also use the Enhanced GPIO. 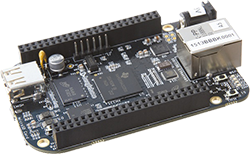 Take a look at Section 5.2.2.3.3, Figure 8 and the rest of Section 5.2.2.3 in http://beagleboard.github.io/am335x_pru_package/am335xPruReferenceGuide.pdf. Too bad the BBB is unobtanium, at least here in the EU. Farnell have produced their own which they ship out when they have stock because they’ve developed their own version. Don’t you think it would help if you first told us what a PRU is ? Did you just assume that because you do, everyone does!